See You At The Pole began when a small group of teenagers felt the need to pray for their community, according to syatp.com. This led them to visit three different schools in their Texas town and gather around the flagpole on each campus. Once there, they prayed for school leaders and their friends. This act was the beginning of a prayer movement that quickly spread to surrounding communities. 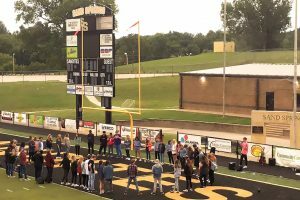 See You At The Pole is now a global emphasis on unity in Christ. It has inspired generations to pray purposefully as a part of the Global Week of Student Prayer. Students from all kinds of schools—private, public and home school—were encouraged to “feel the brokenness all around you and start praying just like Paul did when he prayed ‘Break me, oh God. Let revival begin with me,’” according to the SYATP website. 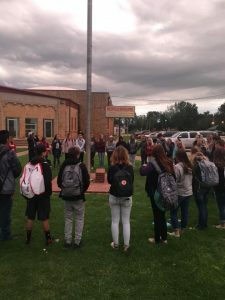 In Oklahoma, students observed SYATP in large numbers across the state. 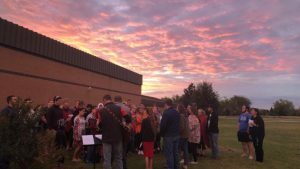 More than 100 students gathered in Watonga, according to Brandon Kalicki, youth pastor at Watonga, First. 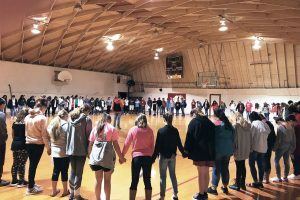 In a Facebook post, Hunter Hayes, youth pastor and music director at Maysville, First said, “Thank you to all the other youth workers in town that helped make this (SYATP) a go! What a blessing it is for me to do ministry with you all as we share one goal, and that is to share the love of Christ with these students. “Maysville is blessed with great students! I love seeing them come together for a great cause! Ashlee Craig, student Fellowship of Christian Athletes leader at Moore High School helped plan the SYATP event at her school. In Moore, students gathered in the gymnasium lobby due to rainfall the morning of SYATP. “It’s incredible to see that I have peers that are willing to put forth the time to come together, worship Jesus and to spread the Word as we get together and fellowship,” Craig said. At Empire High School, in Duncan, SYATP also moved inside due to rain. However, that did not affect the 80 students, teachers and parents who attended the gathering. 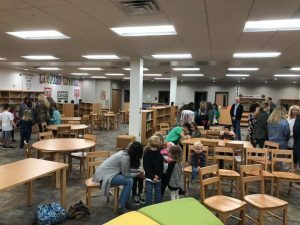 After a time of worship and large group prayer, students broke up into smaller groups and prayed for school administration and students around the world. They were also asked to pray for local, state and national leaders, as well as friends and family. 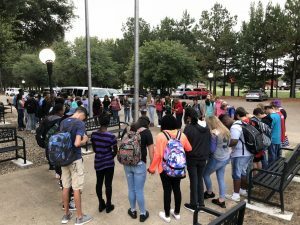 As students gathered nationally to pray for global change, national leaders of SYATP cast their vision for student-lead prayer in schools across America. 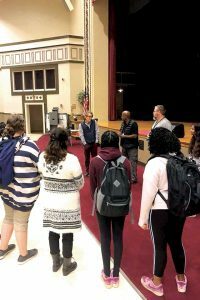 “We dream of a day when students are praying every day at every middle and high school in order that every student may have the opportunity to know the love of Christ,” Clark said. A future edition of the Baptist Messenger will report on See You After the Pole rallies that took place the evening after See You At The Pole. For more information on Global Week of Student Prayer and other resources for students, visit www.skopos.org/syatp.